Shrila Narayana Gosvami Maharaja: I offer my humble obeisances unto the lotus feet of my Gurudeva, nitya-lila-pravista Om Visnupada Shri Shrimad Bhakti Prajnana Kesava Gosvami Maharaja, to all the Vaisnavas, and to Shri Gauranga. By the causeless mercy of Shri Guru and Gauranga, the first fifteen days of our niyama-seva Kartika-vrata (vow to follow the rules and regulations of the Kartika month) have passed without a problem; it passed sweetly and happily. Today, however, we received very sad news. In Shri Chaitanya-charitamrita, Shri Chaitanya Mahaprabhu asked Shrila Raya Ramananda: duhkha-madhye kona duhkha haya gurutara? Krishna-bhakta-viraha vina duhkha nahi dekhi para ["Shri Chaitanya Mahaprabhu asked, 'Of all kinds of distress, what is the most painful? 'Shri Ramananda Raya replied, 'Apart from separation from the devotee of Krishna, I know of no unbearable unhappiness.'" (Chaitanya-charitamrita, Madhya-lila, 8.248)] Shri Mahaprabhu asked Shri Raya Ramananda, "What is the worst type of suffering?" 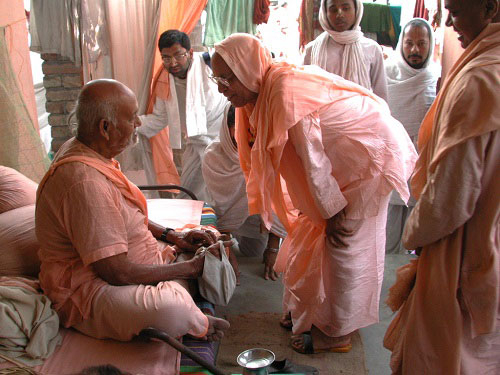 Shri Ramananda Raya replied, "Vaisnava-viraha." Para means 'the highest or greatest.' The greatest or most grievous suffering is Vaisnava-viraha, separation from pure Vaisnavas. After the disappearance of Shrila Bhaktisiddhanta Sarasvati Thakura Prabhupada, my Gurudeva, Shrila Bhakti Prajnana Kesava Gosvami Maharaja, along with a few others, established the Gaudiya Vedanta Samiti; and Shrila Bhaktivedanta Svami Maharaja was one of the founding members. Gurudeva had already taken sannyasa and had been preaching for a long time, but now he established the new Gaudiya Vedanta Samiti's headquarters in Navadvipa and began preaching through the Samiti. As Krishna is bhakta-vatsalya, very affectionate to His devotees, Shri Guru is sisya-vatsalya, very affectionate to his disciples. After some time, some of Guru Maharaja's god-brothers saw his sisya-vatsalya, which was more affectionate than the most loving father could be to his son. These god-brothers could not reconcile this, because previously they had been the objects of all his affection. Hurt, most of them left Guru Maharaja, and only a few stayed with him. Guru Maharaja had three pillars of devotion – three prominent sevakas. Parama-pujyapada Shri Shrimad Bhaktivedanta Vamana Maharaja, Parama-pujyapada Shri Shrimad Trivikrama Maharaja, and I began to serve him totally, with our lives and souls, taking our lives in our hands [an Indian expression meaning 'ready to risk our lives']. From the very beginning, Pujyapada Vamana Maharaja, Pujyapada Trivikrama Maharaja, and I were made the three pillars of the Gaudiya Vedanta Samiti by my Guru Maharaja. At that time Shrila Pariyataka Maharaja was not with us; he joined after some time. Shrila Vamana Gosvami Maharaja, especially, served Shrila Guru Maharaja in so many ways. He was the publisher of our Gaudiya Patrika monthly magazine and many other literatures. He was also the 'scribe' of Guru Maharaja's dictations for his correspondence, articles, and books. Even before I joined, when I was a police officer and had never personally met Guru Maharaja, Guru Maharaja would write to me with great love and affection. He would dictate his letters, addressing me as Tiwariji because I came from a high-class brahmana family with the surname Tiwari, and Shrila Vamana Maharaja would write down his words. Then, after I joined and until I was initiated, Pujyapada Vamana Gosvami Maharaja would also call me 'Tiwariji.' Shrila Vamana Maharaja was like the mother of the Gaudiya Vedanta Samiti. He took care of everyone in the Matha and supplied whatever anyone needed, like prasadam, clothing, and so on. As for Shrila Trivikrama Maharaja, he was very, very qualified. Our Guru Maharaja was in charge of publications, and he put Shrila Trivikrama Maharaja in charge of organizing all the preaching, and his services included sending other preachers to various districts of Bengal. Shrila Trivikrama Maharaja would personally go collecting and preaching, especially in the district of Bardavan, and Guru Maharaja did a great deal of preaching in Midnapura, Chaubis Parganas, and other places. When I first joined, Parama-pujyapada Shrila Trivikrama Maharaja showed me even more familial affection than did Shrila Vamana Maharaja. Our Guru Maharaja placed me in his hands, and we became very close. It was Shrila Trivikrama Maharaja who taught me how to perform kirtana, how to preach, and how to collect donations. And sometimes, in a very loving way, he would also rebuke me. In all the years that I spent with Guru Maharaja, I was never rebuked by him, but with so much love and affection Shrila Trivikrama Maharaja used to do so. We had such a close connection that sometimes our discussions would become very heated; I would counter his arguments and he would counter mine, and our Guru Maharaja would kindly support me by taking my side. Shrila Trivikrama Maharaja used to preach all over India, and when he would go to preach with our Guru Maharaja I would go with them as Guru Maharaja's personal servant. I would massage him, cook for him, wash his cloths, carry a lantern for him because there was no electricity at that time, and I performed many other services. Sometimes I made mistakes, and at those times Shrila Trivikrama Maharaja would protect me. For some time it was a regular procedure that in each village, along with his lectures, Guru Maharaja would present a slide show depicting Chaitanya Mahaprabhu and other great personalities. I once forgot to bring the slide projector, and when I realized this, I was in great anxiety that Gurudeva would be upset with me. Shrila Trivikrama asked me what was wrong, and when I told him he said, "Don't worry. I will handle the matter. I will take care of everything for you." Later on, when our Guru Maharaja was ready to give his lecture and slide show presentation, he asked Shrila Trivikrama Maharaja, "So, is everything ready?" Trivikrama Maharaja replied, "Oh, today is a very cloudy day and it may rain. If you also show the slides, the program will take a long time. The rain may come and everyone will leave before you have completed your class." Guru Maharaja asked him, "Then what should I do?" Trivikrama Maharaja replied, "Why not just give the class?" Guru Maharaja was satisfied to do that. Years later, Shrila Trivikrama Maharaja reminded me of this incident and asked me if I remembered it. I said, "Yes!" and we happily and tightly embraced one another. Guru Maharaja entered nitya-lila in October of 1968, but internally he is always looking after us and encouraging us. Externally, Shrila Trivikrama Maharaja took the place of my Gurudeva in the sense that he encouraged me in all activities. When I began preaching in the West and writing and translating books there, I would write to Parama-pujyapada Shrila Vamana Maharaja and Shrila Trivikrama Maharaja, and others for advice – because they are very qualified preachers. Shrila Trivikrama Maharaja would reply my letters without delay. He would encourage me and inspire me to write more books and to preach all over the world. Pujyapada Vamana Maharaja is the present acarya of the Gaudiya Vedanta Samiti and he was very busy with many grave responsibilities. He was always very happy with my preaching, but sometimes he was sick and therefore he could not always answer my letters. Pujyapada Trivikrama Maharaja, on the other hand, usually remained in one place, and he always replied without delay; I cannot forget him. 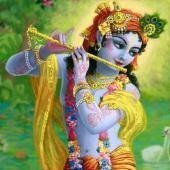 I consider both Bhaktivedanta Vamana Maharaja and Bhaktivedanta Trivikrama Maharaja to be my siksa-gurus. They supported, nourished and inspired me so much so that I cannot express my feelings in words; but Pujyapada Trivikrama Maharaja's familial love for me was even greater than that of Pujyapada Vamana Maharaja. We used to sleep together, quarrel together over philosophy, and we loved each other in so many ways. Sometimes we presented different ideas and we countered each other's arguments, but he greatly honored me. Although I was giving honor to him as a siksa-guru, sometimes, in his last days, he used to offer me sastang pranama (offering of obeisances while lying on the ground like a rod). He even used to offer pranamas to my sandals when I was not present before him. No one else could have done this; he was so polite and humble. He was a senior Vaisnava in all respects and he could help the entire world, but he used to write me, "We cannot do the services you are doing for Gurudeva, so I especially favor you and praise you. May you preach for a long time. May you write and publish many books." We have lost one of the pillars of the Gaudiya Vedanta Samiti today, but I feel some relief knowing that he left during this Kartika month, during niyama-seva-vrata, and that he was in Navadvipa-dhama. Also, he left at the time of amrta-yoga, an auspicious time of the day according to the movement of the sun and moon, and it was also tritiya-tithi, one of the most auspicious days of the month. Internally, in my heart, Shrila Trivikrama Maharaja told me that he would leave this world after we observe those festivals; it was a wonderful thing. Otherwise, if he had left before, we would have been absorbed in thoughts and activities in relation to him, and we would not have been able to properly observe those important holy functions. Now, being the representative of you all, I am offering my heartfelt puspanjali at his lotus feet. I think that he has been placed in Samadhi today. Where is he now? He is in Navadvipa-dhama or Vraja-dhama. I pray for all of us that he will be very merciful to me, and to all of you, and that he will inspire us and give us blessings so that we can try to serve Gurudeva and do bhajana as he did. The disappearance day of Pujyapada Shrila Trivikrama Maharaja ki jaya!